Pork and Charred Brussels Sprouts | Om nom nom! Preheat oven to 450°. Separate brussels sprout leaves; thinly slice hearts. Set aside. Season pork with 1/4 tsp. each salt and pepper. Brown in 1 tbsp. oil in a large frying pan over high heat, turning, 8 to 10 minutes. Toss sweet potatoes in a roasting pan with onion, 2 tbsp. oil, and 1/4 tsp. each salt and pepper. Add pork. Roast 15 to 20 minutes for medium-rare, stirring vegetables once. Meanwhile, purée honey, lime juice, fish sauce, garlic, ginger, and Sriracha in a blender; set sauce aside. Heat 1 tbsp. oil in the frying pan over high heat and lightly char half the brussels sprouts, stirring, 2 minutes. Transfer to a bowl. Repeat for remaining brussels sprouts. Toss with 1/2 cup cilantro and 1/4 cup sauce. 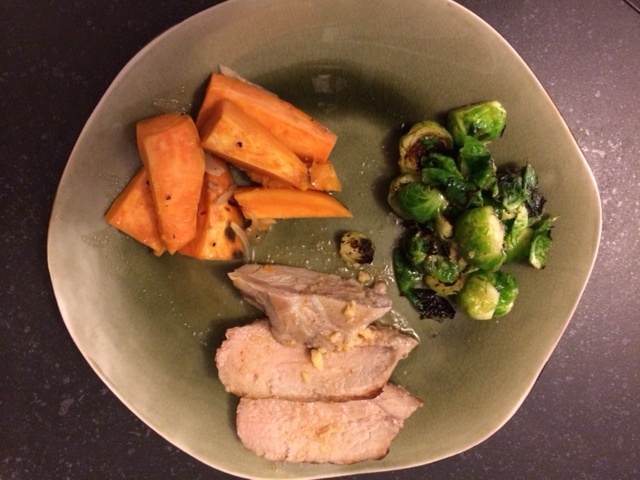 Slice pork, toss sweet potatoes with remaining cilantro, and set on a platter with brussels sprouts. Drizzle more sauce to taste over everything.